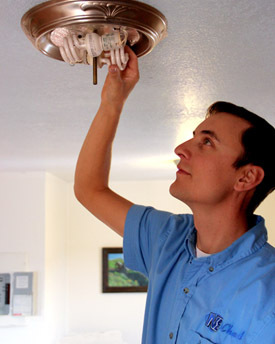 FROM NETWORKS & CEILING FANS, TO OUTLETS & RECESSED CANS, WE FIX PROBLEMS FOR OUR CUSTOMERS. Hello and thank you for visiting Nash Electrical Services Inc. It is our goal to be your electrician, and provide you with helpful, affordable, honest and punctual electrical help whenever your needs arise. We have no hidden or extra fees. We treat everyone fairly with honesty and integrity. We discuss all work before we start, and we walk through all work when completed with your 100% satisfaction being our goal. Give us a call and "We'll turn the light on for you." Let us know how we can help you, we'd love to hear from you.